Now don’t get me wrong, dorm food is good for a few weeks…until you are just sick of it and dying for a change in venue and dining options. I mean one can only eat Gordon’s pizza for so long. After finding a group of friends that I clicked with here at school, they asked me one evening when we were hanging out if I had ever been to Paul’s Pel’meni. My answer was, “…no…what’s pel’meni?”. To put it in layman’s terms, pel’meni is basically thin dough with meat or potato wrapped inside, similar to a pierogi. What makes Paul’s so great, is that it is more than ‘just a Russian dumpling’. Paul dresses the pel’meni with butter, cilantro, sweet chili sauce, yellow curry, and a side of sour cream. I always get a mixed order (half ground beef and half potato), which constantly makes it an unexpected surprise of which kind of dumpling I’m going to bite into next. If I was asked what a bite of Paul’s Pel’meni tastes like I would say, “The first thing that hits you is the curry, it is fairly fragrant, but not too overwhelming. The sweet chili sauces bites through, adding to the heat, but giving you the sweet taste you didn’t know you were craving. The butter and cilantro work together to draw out the heat, with the sour cream giving you a nice cool finish. Not to mention, the delicious ground beef and potato dumpling underneath all of this delicious topping”. 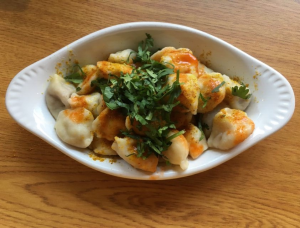 So when it comes time to escape the dining halls, head over to Paul’s Pel’meni!